Objects can be assigned to different layers. 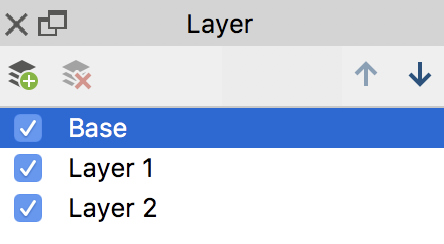 If you ignore this option, all newly inserted objects will be assigned to the same standard “Base” layer. The Layer option makes it possible to display or to remove parts of the drawing, so you can, for example, design a presentation that gradually increases in complexity. You can start building a model with only a few elements and gradually increase the number of elements that are displayed, thus creating a structure that continually gains complexity. The Layer function can be activated by clicking the layer icon in the Start tab. This will open a window in which the existing layers are listed. At first, this includes only the “Base” layer. You can define a new layer by selecting New. Any object on the drawing pad can be assigned to a certain layer. Just choose the option Layer after selecting the object with the right mouse button and assign the object to the desired levelin the menu. To display a level, simply put a checkmark in front of the desired layer in the dialogue window. Tip: You can also set the assignment of a selected object in the Properties window in the Object area.